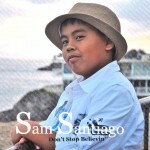 Thank you so much for ordering Sam Santiago “Don’t Stop Belivin” CD. Please allow 2 to 3 weeks for delivery. In some cases shipping may be faster.